In elementary school I had the same art teacher from Kindergarden through the 5th grade. One year, she taught us about pop art. She told us to think of ordinary objects that we could make out of clay, so I made a glass 7 up bottle with a crack in it. (I decided since pop art was a movement from the 60s, I should do a vintage ordinary object. Plus my dad had a cool 7 up wooden crate and I wanted him to like my work, so it seemed linear at the time). The broken bottle was my favorite sculpture I ever made, but I was as terrible at glazing then as I am now, so it came out 'statue of liberty green,' leaving me slightly disappointed. This was one of my first lessons in how difficult it is to get something you see so vividly out of your head correctly. Looking back at pop art is not always easy for me because a lot of what popularized it is really terrible in my opinion. And some of what pop artists did later in their careers (during the 90s especially) is unforgivable. 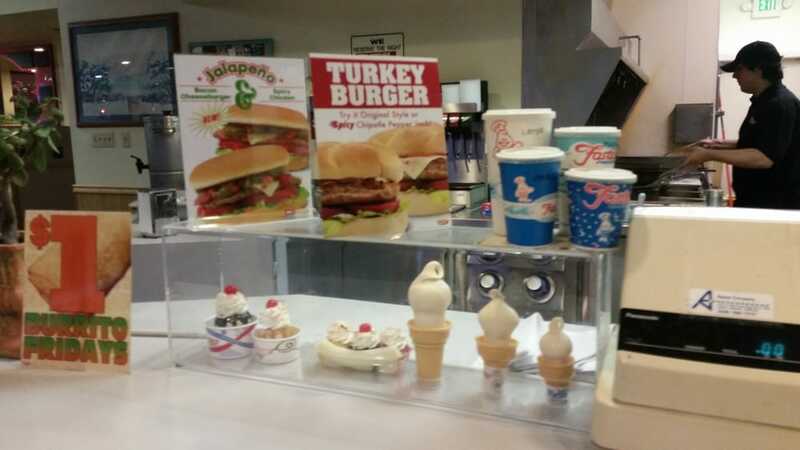 But, growing up in Southern California, I've always had a thing for fake food displays, which were found at fast food restaurants like Foster's Freeze's. These little displays always seemed like accidental pop art to me. 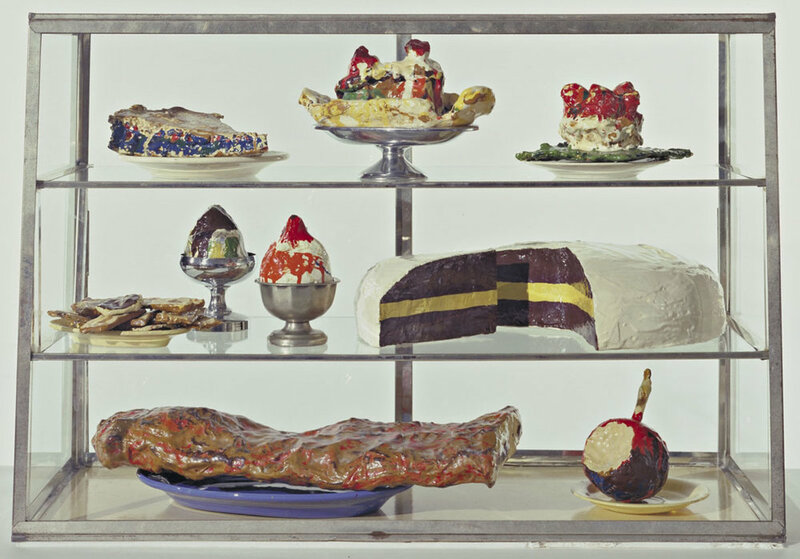 In the vein of Foster's fake food displays, while poking around on pinterest recently, a friend of mine (Dorothy Hoover) posted a picture of Claes Oldenburg's The Store. 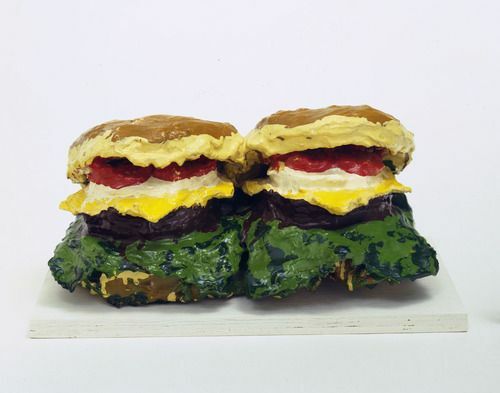 I had never heard of Claes Oldenburg, but his work caught my eye, so naturally, I began researching. 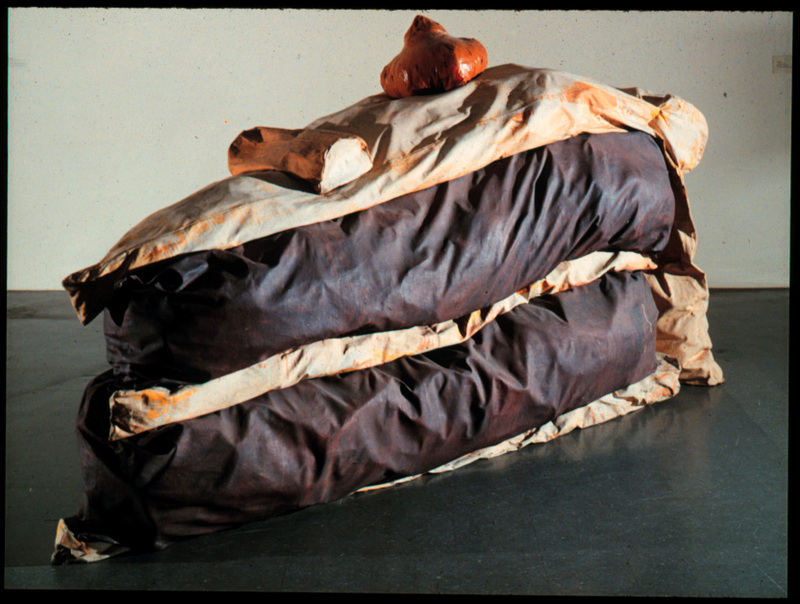 Claes Oldenburg was born on January 28, 1929 in Stockholm. Son of a Swedish diplomat, Oldenburg spent his early years in New York until 1936, when his family moved to Chicago. In early adulthood, Oldenburg studied literature and art history at Yale between 1946 to 1950, and continued his education back home at the Art Institute of Chicago. In 1956, Oldenburg moved to New York where he worked in the library of the Cooper Union Museum for the Arts of Decoration. After three years of working in this enviroment, Oldenburg started to make figures, signs and sculptural objects out of papier-mâché, and everyday materials. This work led to his first exhibition, The Street in 1960-1. The Street exhibited at the Judson Gallery (at the Judson Memorial Church, my favorite location for art in NY during the 60s and 70s). The exhibition showcased ordinary objects and everyday consumer goods made from cardboard, burlap, and newspaper that recreated scenes from street life in New York City. Abstract Expressionists are credited for having introduced ordinary objects in their artwork beginning in the 1940s, but it wasn't until pop art hit New York that these ordinary objects were not only depicted, but they were also used as medium. During this time, Oldenburg fueled a movement that influenced other artists through the 1970s, opening up a variety of media as fair game. 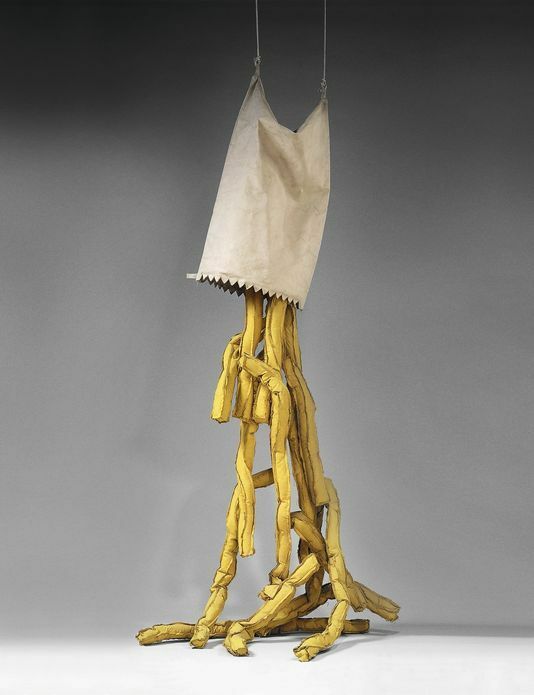 In 1962, Oldenburg created my favorite exhibition, The Store, which was a comedic display of a somewhat distopic throwback to New York's Five and Dime stores where everything from mops and men's shirts, to canned foods and seasonal decor could be purchased. 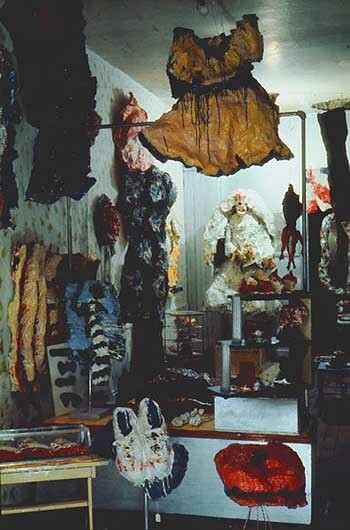 In a rented store front in the East Village, Oldenburg again used materials from everyday objects. The Store, or My Store, or the Ray Gun Mfg. Co., located at 107 East 2nd St., NYC, is eighty feet long and is about ten feet wide. In the front half, it is my intention to create the environment of a store by painting and placing (hanging, projecting, lying) objects after the spirit and in the form of popular objects of merchandise, such as may be seen in store windows of the city, especially in the area where The Store is (Clinton St., for example, Delancey St., 14th St.). From the entries published in Writing on the Side, we learn that leading up to his creating The Store, he meticulously catalogued every sandwich, can of beer, box of cigarettes and brand of soap he purchased, as well as every cafe and restaurant he visited as a reference for his body of work. 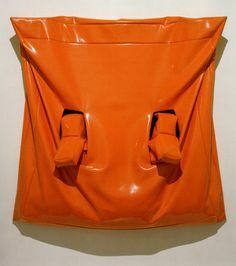 From here, Oldenberg continued to create and work with ordinary objects, making an ongoing series known as Soft Sculptures. These are some of the funniest pieces in my opinion, because with the help of his first wife, he sewed oversized everyday objects such as cake (which he hilariously calls Floor Cake), toilets, and household appliances. Considering the early 60’s was still feeling the affects of the 1950’s futuristic, perfect, automated, domestic ideologies, Oldenberg's almost grotesque, and very hand-made portrayal of these objects was a jab at the American Status Quo, and perhaps at the same time, an homage to what seemed like a dwindling way of American Life. Around the same time that Oldenberg started making sculptures, he also participated in performance art at the Judson & then later at The Store. These performances made by pop artists were known as Happenings, and Oldenberg's particular theatre was called Ray Gun Theatre. The main idea behind pop art was to take art out of the 'white walled gallery' and 'off its pedestal;' an idea that had not yet become palatable to the everyday art lover. By turning the audience into "just another object" the performances were meant to express the frustrations artists had with the status of the art world at the time. From the attention received between The Street, The Store, and Soft Sculptures, as well as his time working at the Judson, Oldenberg is now credited with helping create the Pop Art movement, which began in New York. But shortly after his first exhibitions, Oldenberg moved to Los Angeles in 1963, "because it was the most opposite thing to New York [he] could think of." (Funny because I left LA for NY for the exact same reason). Once in LA, Oldenburg created a performance called AUT OBO DYS, a quintessentially Los Angeles performance done in a parking lot. After this work, Oldenburg shifted his focus to sketching and idealizing large-scale sculptural monuments in public spaces. In 1967 his first sculpture was afforded by New York city cultural adviser Sam Green. This was Oldenburg's first outdoor public monument known as Placid Civic Monument, which was a performance made behind the Metropolitan Museum of Art with a crew of gravediggers digging a 6'x 3' rectangular hole in the ground. Oldenburg was met first with criticism and opposition, because his works he wanted to create were gigantic public sculptures of ordinary objects. But today, most of Oldenburg's recognizable work comes from this period and is displayed in public spaces throughout the United States. To be honest, I appreciate his progression, but I LOOOOVE the 60’s work and just don't appreciate his later work as much. For this reason, I'm not posting any pictures here but you can find them very easily on the internet. However, fast forward more than 50 years and Oldenburg's Store is showing up as a major influencer for in recent exhibitions, including a fake Bodega in NY's meatpacking district and at the Volta Fair in NY where clay/plaster mops, bottles of Tide detergent and an overturned studio stool covered in chewing gum directly recreate objects using Oldenburg's concepts behind The Store. When Bigger Is Better: Claes Oldenburg has spent the past 35 years blowing up and redefining everyday objects, all in the name of getting art off its pedestal. Kristine McKenna, Los Angeles Times, July 2, 1995. Video: Upside Down City (1962) by Claes Oldenburg. Walker Art Center, February 2010. The first time I saw the above image I was 11 years old. The postcard was pegged to a bulletin board collage at my friend Blake's house. The same friend who influenced me to think that anything "trendy" was super lame. Blake also owned a Prada purse. My mind was blown. I didn't understand Descartes, "I think, therefore I am" at that age, but I understood the Barbara Kruger version enough to know that the artist was taking a stab at consumerism. No one told me the artist was Barbara Kruger, that was something I learned a few years later, but already, I felt like whoever this was, they were speaking on behalf of people like me. Barbara Kruger is more contemporary of an artist than those I usually post about, but I've noticed ad campaigns all over recently that straight rip her style without honoring the jabby undertones of what the red background with white text, or white background with black text has come to mean, so I thought I'd revisit her work a little bit to set the record straight. 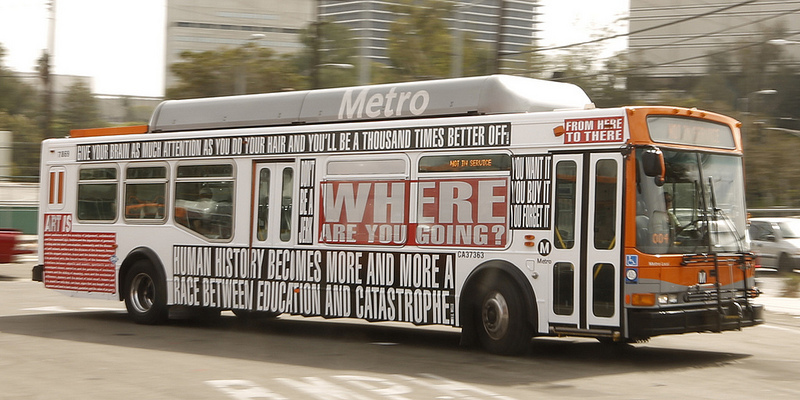 Barbara Kruger has most recently lived and worked in Los Angeles. Given that I lived 12 years in Los Angeles, and spent 30 years in California in general, Barbara Kruger's work is a personal subject. In my youth, I was a staunchy feminist, and a critic of consumerism who hung in the 'art scene.' Barbara Kruger wasn't as much of a god as she was like the LA sunshine to me, just something that shows up everyday. Plus I grew up in a Stepford Wives-type suburb, where money and female oppression were the norm. I saw Barbara Kruger as my voice. I even started putting my own statements on the artwork I made as a teenager, she had influenced me that much. Barbara Kruger is among the first to use appropriation art through pictures and text, something that has since become a widespread practice in fashion, art, and funny enough, now even in advertising. 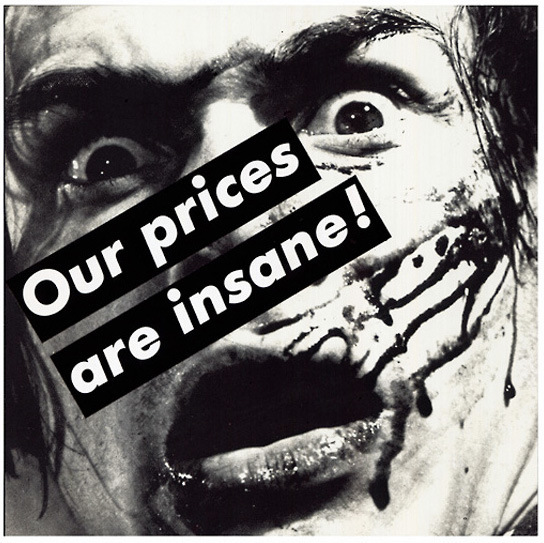 By using words and found images, Kruger subverts the common ad with social critique through postmodern conceptual art. For me personally, Kruger's humor and dark undertones used to discuss reproductive rights and built in female oppression (something I still think even the most evolved males: gay/straight/trans or otherwise, have yet to fully comprehend) has always stood out to me. The work is politically charged, totally in the vein of Bauhaus graphic design, and easy to understand, even for the simpleminded folks who oppose her messages. Barbara Kruger was born in Newark, New Jersey in 1945. She attended Syracuse University in 1964 for one year before moving to New York, where she studied at Parsons School of Design. At Parsons, Kruger met artists Diane Arbus and Marvin Israel, who are said to have introduced Kruger to photography, fashion, and magazine sub-cultures. After a year at Parsons, Kruger dropped out and started working with various Condé Nast magazines as a graphic designer, where she was quickly promoted to art director and picture editor for several magazines. This career went on for a decade before Kruger moved to Berkeley, California, where she taught at UC Berkeley for four years. By 1979, Kruger started using found images from mid-century American magazines in her art, pasting messages in Bauhaus fonts with color blocked backgrounds over the found pictures. Applying her graphic design sense, Kruger's work mimiced advertisements, but subverted the familiar with topics of gender, consumerism and equality. What's really cool is once Kruger saw that her work was well received, she started printing her images on gift items, so the 80s and 90s were flooded with Kruger tote bags, postcards, mugs, t shirts, posters, whathaveyou; which is a hilarious way to blur the boundaries between art and consumerism, while also expanding her reach in a similar fashion as branding does. (Hello? Genius). Using the power of her ubiquity, Kruger became well known for her work, and was often commissioned to make political statements on behalf of groups such as reproductive rights advocates. Like me in my youth, Kruger was seen as a voice for people who had something to say. Evolving with contemporary art, from the 90s through today, Kruger began creating site-specific work that is pasted on sides of buildings, buses, trains, and museum walls. Commissioned by MOCA of Los Angeles, the image top right, is the among the first of her site-specific work. The concept originally included messages pasted over the the American Pledge of Allegiance, but after some test drives with the idea and community backlash, the work was toned down, and the flag salute was eliminated. This image was first exhibited in a group show, and then a year later pasted to the side of a warehouse in Little Tokyo, Los Angeles where it showed for two years. I love Barbara Kruger so much I could catalog her entire work here, but in the end, it's all much of the same thing. Even if it's really good. Today, given that she is fairly well known, she continues to work on site-specific pieces through commissions all over the world. She also keeps making her paste ups, as we have seen that over the last 30 years, change is slow enough to come that her messages are as poignant today as they were at their beginnings. With the seeming timelessness of her style, Kruger is able to revisit mediums and platforms such as magazine covers and simple paste ups regarding abortion, political statements, female oppression, popular culture and consumerism. I felt like since her work is so familiar at this point, that it was almost "too soon" to talk about her here, but I couldn't help it after seeing so many ads abusing her style. Guys, if you're going to rip her off, at least make the words say something punk.